Smith and Lord (1997; their fig. 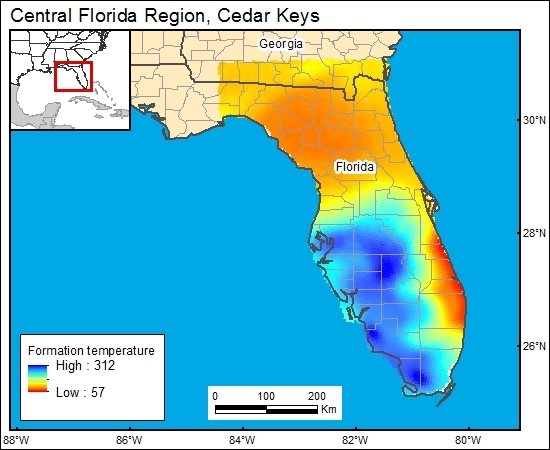 2.10) presented a map showing geothermal gradients across Florida. Their map, in combination with the depth to formation, was used to derive the formation-brine temperature distribution in the GIS. Note that the geothermal gradients of Smith and Lord closely match those of Blackwell and others (2000). Vernon (1970) reported some significant decreases in temperature with depth in some wells and attributed these reversals to fresh-water flow thorough cavernous zones. Vernon, R.O., 1970, The beneficial uses of zones of high transmissivities in the Florida subsurface for water storage and waste disposal: Florida Geological Survey, Information Circular No 70, 39 p.